& they shall be as frontlets between your eyes. Like all other religious rituals in the world, the use of the Tefillin is semiotic in nature. All religions in the world use sacred objects as symbols of declaration of their faith and used as intensification and transition rites. Wearing Tefillin is a constant reminder of God's commandments and acts as an ongoing Rite of Intensification which makes the faith rooted and grounded for generations. It also acts as a means of transference of faith. It is usually used in the rite of transition into maturity at the time of Bar Mitzah. The word literally means “Son Commandment” following the Shema as given to Israel. Menahem ben Jacob ibn Saruq ( 920- 970 AD. whose work “Mahberet” was the first complete lexical treatment of the Biblical vocabulary composed in Hebrew ) explains that the word is derived from the Hebrew Ve'hateif and Tatifoo, both expressions meaning "speech", "for when one sees the Tefillin it causes him to remember and speak about The Exodus from Egypt.’. In that sense it is something meant to start a conversation - a conversation piece - and help in the edification. 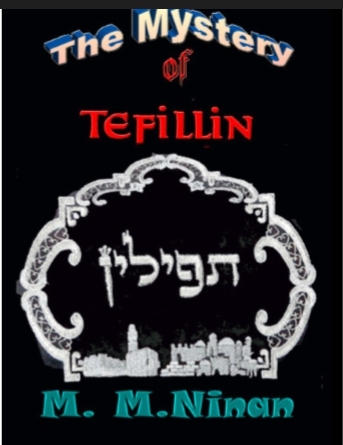 The first texts to use "Tefillin" are the Targumim and Peshitta and it is also used in subsequent Talmudic literature. The word "Tefillin" may have derived from the Aramaic palal, "to plead, pray," a word closely related to the Hebrew tefillah, "prayer." Jacob ben Asher(14th century) suggests that "Tefillin" is derived from the Hebrew pelilah, "evidence," for Tefillin act as a sign and proof of God's presence among the Jewish people. The word ‘Phylacteries' comes from an ancient Greek term phylacterion, of phylássein, φυλάσσειν meaning "to guard, protect" meaning ‘amulet’. The only instance of the name "phylacteries" in ancient times occurs once in the Greek New Testament (Matthew 23:5). "Phylacteries" comes from the Greek phulaktērion φυλακτήριον, "defences," and in late Greek, "amulets" or "charms." The word phylakterion, literally means, "means of protection." It refers to magical charm and amulet. The Peshitta New Testament of c 450 AD definitely translates of Mat 23:5 as tephlaihon. Amulets were part of the Jewish tradition as in all cultural and religious traditions. Due to proscription of idols, Jewish amulets emphasize text and names Examples of textual amulets include the Silver Scroll (as found in Kettef Hinnon dated c. 630 BC) and the still contemporary mezuzah and Tefillin. There was also visual symbolism as in the Hand of Miriam, an outline of a human hand. During the Middle Ages, Maimonides and Sherira Gaon (and his son Hai Gaon) opposed the use of amulets and derided the "folly of amulet writers." Other rabbis, however, approved the use of amulets since both the powers of God and the power of darkness (because of the freedom granted by God) exist in human realm. Though amulet themselves are mere symbols and worthless they remain as potent reminders in common lives and to provides impetus to conform to our declared faith and empower our person the power of choice. Magic and alchemy had been the basis of development of science. Rabbi and famous Kabbalist Naphtali ben Isaac Katz ("Ha-Kohen," 1645–1719) was said to be an expert in the magical use of amulets. He was accused of causing a fire that broke out in his house and then destroyed the whole Jewish quarter of Frankfurt, and of preventing the extinguishing of the fire by conventional means because he wanted to test the power of his amulets; he was imprisoned and forced to resign his post and leave the city. The only instance of the name "phylacteries" in Biblical times occurs is in the New Testament (Matt. 23. 5), where it has passed into the languages of Europe. In rabbinical literature it is not found even as a foreign word. The Septuagint renders it as "ṭoṭafot" (A. V. and R. V. "frontlets"; Ex. 13. 16 and Deut. 6. 8) by ἀσαλευτόν meaning "something immovable"; nor do Aquila and Symmachus (c. AD 150) use the word "phylacteries." Thus opinion differs as to the function of Tefillin as magical amulet. The Targumim (Jonathan, Onḳelos) and the Peshiṭta use the term "Tefillin" (Ex. 13: 9, 16; 28: 37; Deut. 6:. 8, 28: 10; Ezek. 24. 23; Cant. 8. 1) or "ṭoṭafot" (II Sam. i. 10; Ezek. 24. 17 et seq.). The terms "tefillah," "Tefillin" only are found in Talmudic literature, although the word "ṭoṭafah" was still current, being used with the meaning of "frontlet" (Shab. 6. 1). Thus the use of Tefillin as magical "phylacteries," lack historical basis, since this name was not used in truly Jewish circles in early days. The laws governing the wearing of phylacteries were derived by the Rabbis from four Biblical passages (Deut. 6:6-8, 11:18; Ex. 13:9, 16). There are certain rituals in Judaism which are referred to in the Torah as an תוֹא ‘Ot’ – a sign of the binding relationship between the Jew and God. The Shabbat is called an ‘Ot’; circumcision is described as an ‘Ot’; the Mitzvah of Tefillin joins the group of ‘Otot’. Maimonides details of the sanctity of Tefillin and writes that "as long as the Tefillin are on the head and on the arm of a man, he is modest and God-fearing and will not be attracted by hilarity or idle talk; he will have no evil thoughts, but will devote all his thoughts to truth and righteousness.’ The Sefer ha-Chinuch (14th century) adds that the purpose of Tefillin is to help subjugate a person's worldly desires and encourage spiritual development. Joseph Caro (16th century) explains that Tefillin are placed on the arm adjacent to the heart and on the head above the brain to demonstrate that these two major organs are willing to perform the service of God. Thus the very awareness of the presence of the Tefillin forces the atmosphere and attitude of the person. 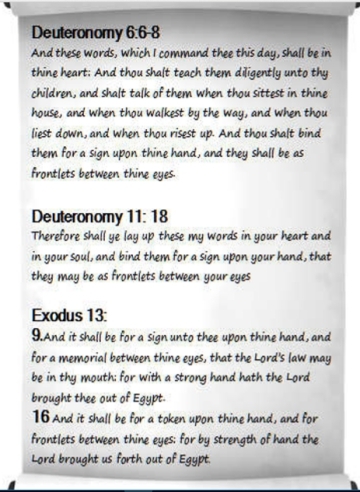 Taken literally the word of the Lord is to be a sign on the hand and frontlets or sign between the eyes. How to interpret these words into reality is not really specified by the scriptures. This was left to the Rabbis to interpret. Does this mean that it is to be written on the hands and forehead or is it symbolic. Should we use tattoos or tie the scrolls down? The donning of Tefillin is an essential observance for Jewish males above the age of bar-mitzvah. According to the prophet Isaiah (38:16), All who don Tefillin are granted a longer life, as is written, ‘O Lord, with these things men live’. There are two groups of opinions: One group holds that this statement is not to be taken literally but in the spirit. Our actions and thought and behavior should reflect the words of God so that others may see and glorify God. Reform Jews understand the commandment figuratively–keep God in mind as if the mitzvot were carried on your hand and forehead. This is the stand of the Karaites, Samaritans and Falashas also. Over the ages, the Tefillin were given various symbolic interpretations by the Reformed Jewish culture. The second group consists of Rabbis who hold that the words of God must be written down on some material and tied to the hand and to the head as symbols of allegiance to the Word. Orthodox and Conservative Jews take the commandment literally. While these passages were interpreted literally by most commentators (comp., however, Ibn Ezra and RaShbaM on Ex. 13: 9), the Rabbis held that the general law only was expressed in the Bible, the application and elaboration of it being entirely matters of tradition and inference (Sanh. 88b). Thus the practice of construction procedures, materials used and the way it is tied developed through the history of Judaism. Rabbi Judah ben Bathyra claimed that he had Tefillin dating back to the time of Ezekiel (c. 600BC). (San. 92b.) There are no record of people wearing phylacteries in the Old Testament. That should tell us something. As for historical records, the International Standard Bible Encyclopedia states: “It is not known when the custom (of phylacteries) began. It was unknown among the Samaritans, hence . . . the custom must have developed after the Samaritan-Jewish schism (3rd Century B.C. )” (1986 edition, vol. 3, p. 864, article “Phylactery”). 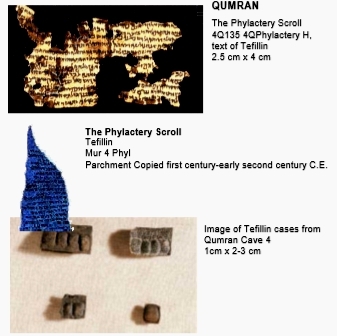 The oldest known fragments of phylacteries came from the excavations at Qumran and Murabba’at, the Dead Sea Scrolls sites where manuscripts dated from the early A.D. 100s were discovered. Dozens of Tefillin scroll fragments containing excerpts from Exodus and Deuteronomy have been uncovered at Qumran. The historical record leads to the conclusion that the origin of phylacteries had its birth in the Jewish exiles in Babylon when Judah in dispersion was trying to find their identity in a foreign land. Thus it probably was developed as a statement of identity of Israel in dispersion. Thus in effect Torah has two parts: The "Torah Shebichtav" (Written Law), which is composed of the twenty-four books of the Tanach, and the "Torah Sheba'al Peh" ( )(Oral Law). God told Moses that he will give him "the Torah and the commandments." Why did God add the word "commandments?" This indicates that God gave additional “commandments”, which are not included in the Torah? This verse (amongst others) is a clear inference to the existence of the Oral Torah. Remember Moses was with God for forty days and forty nights. What else was he doing this period if he was not being instructed in all the wisdom? Hence the tradition that God handed down to Moses many other commandments besides those which he had written down. These form the tradition of the Israel. (http://www.hebrew4christians.com) This tradition was passed on from generation to generation. However since it is orally transmitted they include additions and edicts and ordinances enacted by the sages themselves throughout the generations, and laws and teachings extrapolated from the Torah's verses along with the commentaries and explanations- employing methodology prescribed by Moses (as he was instructed by God).These form the traditions. 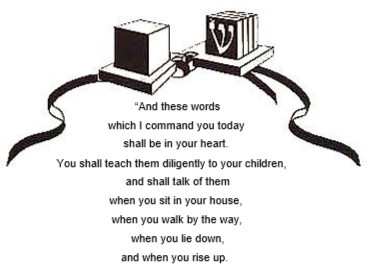 It is the Talmud, the authoritative oral tradition for Rabbinic Judaism, which laid down rules and regulation regarding what are to be bound to the body and the form of Tefillin. “Tefillin are the post biblical Hebrew term for two small boxes containing Torah passages written on pieces of parchment, with leather bands attached to the boxes in such a way that one may be worn on the forehead, between the eyes, and the other tied to the arm. Tefillin (from tefillah, prayer) are the name of a small tractate The Oral Law consists of three components: 1. Laws Given to Moses at Sinai (Halachah L'Moshe M'Sinai): Some examples of Halachah L'Moshe M'Sinai are: Tefillin straps must be black; a sukkah must have at least two and a half walls, and all the different Halachic measurements and sizes. 2. The Thirteen Principles of Torah Exegesis (Shlosh Esreh Middot ShehaTorah Nidreshet Bahem): A full list of the thirteen principles can be found in the prayer-book.2 3. Edicts (Gezayrot): The rabbis constantly added gezayrot according to the needs of their times. The Torah authorizes the rabbis to protect the word of the Torah through making "Gezayrot" (edicts). Until the end of the Talmudic Era there was a central rabbinic authority which issued gezayrot which were accepted by all the Jews. 1. The parchments must be made of the outermost hide (Klaf) of a kosher animal. 2. They must be written with a permanent black ink. 3. The parchments must be tied shut with the hair of a kosher animal. 4. They must be placed in a perfectly square leather box. 5. The box of the head Tefillin must be inscribed with the Hebrew letter Shin. On the right side of the box, this is the usual three-headed Shin, while on the left side, it must have four heads. 6. The boxes must have a somewhat wide base. This is called the Titura. 7. This base must contain an opening through which the straps are passed. This is called the Ma’abarta. 8. The boxes must be sewn closed with thread made from the veins or sinews of a kosher animal. 9. The Tefillin must be bound with leather straps, dyed black on the outside. 10. The strap of the head Tefillin must be tied with a knot in the shape of the Hebrew letter Dalet. The hand Tefillin must be tied with a knot shaped like a Yud. It is not known whether this command was carried out in the earliest time, and if so, in what manner. But from the relatively large number of regulations referring to the phylacteries—some of them connected with the names of the first tannaim—and also from the fact that among the fifty-five "Sinaitic commands" ("halakah leMosheh mi-Sinai") eight refer to the Tefillin alone and seven to the Tefillin and the Torah together, it follows that they were used as early as the time of the Soferim—the fourth, or at least the third, century B.C. 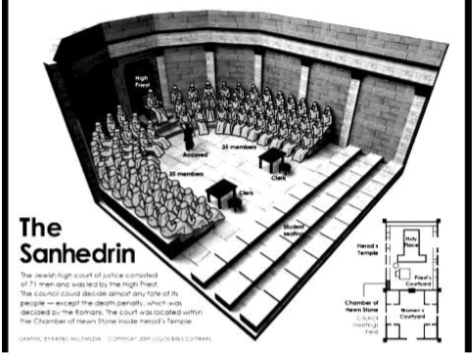 The Sanhedrin was the supreme council, or court, in ancient Israel. The Sanhedrin was comprised of 70 men, plus the high priest, who served as its president. The members came from the chief priests, scribes and elders, but there is no record on how they were chosen. After the destruction of the Second Temple in Jerusalem in 70 AD, without the Sanhedrin and Priests the emphasis changed to teaching of tradition and faith by the teachers. This period became known as the Tannaim —“teachers”. It was these teachers who finally collected the fragmentary Oral Laws passed down from generation to generation and assembled them and is known as the Mishna. The codification was given final form early in the 3rd century AD by Judah ha-Nasi (135-220 A.D). He assembled the Mishna into six major sections, or orders (sedarim), that contain 63 tractates (massekhtaot). These provide the accepted legal traditions since the time of Ezra (450 BC). (Men. 35a; Yer. Meg. 1:9; Maimonides, in "Yad," Tefillin, 1: 3, mentions ten; Rodkinssohn, in "Tefillah leMosheh," p. 20, ed. Presburg, 1883, mentions eighteen). The earliest explicit reference to them that has been preserved—namely, in the Letter of Aristeas (verse 159; see Kautzsch, "Apokryphen," ii. 18)—speaks of them as an old institution. 1. Pre-second temple period: Formation of scripture, whereby terms as totqfot were understood in their Egyptian-Assyrian religious context. 2. 2. Early second temple period: Part of scripture and probably read metaphorically. 3. Late second temple period: Beginning of literal reading and formation of ritual as a protective amulet and symbol of Jewishness, which explains the Septuagint translation of phylacteries (amulets). 4. Post-second temple period: Common acceptance of ritual wherein the centre place of the Torah is emphasized. Only groups as the Karaites and modem reformist Jews uphold a metaphorical reading and reject it as a ritual.